1000 CFM 3-Speed White Portable Evaporative Cooler for 300 sq. ft.
NewAir AF-1000W White Portable Evaporative Cooler, if you want to enjoy fresh, clean and cool air on a hot summer's day then the NewAir AF-1000W white evaporative cooler may be just what you have been searching for. This compact evaporative cooler by NewAir uses only the natural cooling power of evaporation to cool rooms up to 300 sq. ft. Along with being super powerful; it also looks fabulous, with a simple but striking shade of white. Cools Up to 300 sq. ft.: The NewAir AF-1000W will cool, freshen and clean the air in any small to medium sized room up to 300 sq. ft. Not only will it save you money over the costs of traditional air conditioners powered by refrigerants, but it is also a better choice for the environment and your family as well. This Earth-friendly cooling method does not require any harmful chemicals or refrigerants to operate. Unmatched Efficiency: The NewAir AF-1000W is one of the most striking and eye catching residential evaporative cooler units on the market. 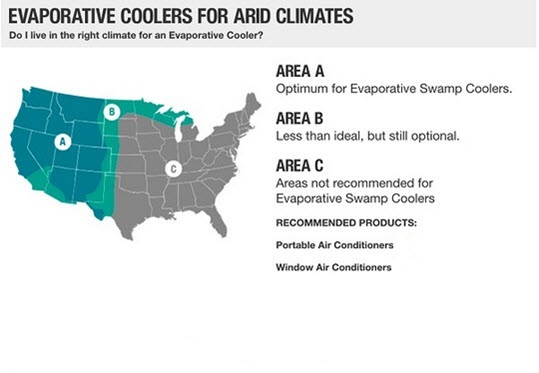 This is because this portable swamp cooler offers unmatched efficiency and value. Besides that, this powerful and compact unit is also Earth-friendly, so you can feel good about your purchase. It is also guaranteed to help add a splash of color to any environment. Which type of evaporative cooler is best suited for your needs?